I don't go downtown often. If someone says they live in downtown Phoenix, the first response is usually "why?" There's light rail now, and impressive sports arenas, but try and find a sandwich after five o'clock. Then IRA came to town and I had books to sign and swag to amass. I set my GPS, which is the gift from the gods my directionally challenged soul has been asking for its entire, turned around life, giving me a freedom not known since I decided to wear shorts under my skirt to play on the monkey bars, and headed for the convention center. The economic day of reckoning being upon us, attendance was underwhelming, but for this illustrator, meeting folks and signing books is always a thrill. 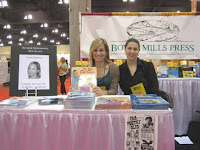 Brittany from Boyds Mills Press was the ultimate booth manager: calm, friendly and unflappable, something I envy as I tend to start flapping at the slightest provocation. We got a lot of books out there, and I went home with a nifty tote bag.